In recent years, the Infiniti QX80 has topped my list of dream SUVs for road trips. It’s so spacious, so quiet and so sumptuously smooth that it makes a Cadillac Escalade shod with 22-inch wheels feel like a dump truck in comparison, so I can’t think of any SUV I’d rather drive on the highway. The QX80 is just that good, assuming you want an old-school, cotton-candy luxury ride like I do. Well, now the big Infiniti has some fresh competition from its corporate cousins at Nissan. The new 2017 Nissan Armada rides on the same platform, drives with almost the same panache and even shares much of the same styling with the QX80, all while starting at a dramatically lower price. The new Armada starts at $44,400, which is not only a far cry from the QX80’s $63,250 base price but also very competitive with full-size SUV stalwarts like the Chevy Tahoe ($47,000) and Ford Expedition ($46,225). Powered by a deep-throated but buttery-smooth 5.6-liter V8, the Armada makes 390 horsepower, letting Nissan claim best-in-class bragging rights. Interestingly, it’s also a bit less horsepower than this same engine makes in the QX80, which is tuned to burn premium fuel. 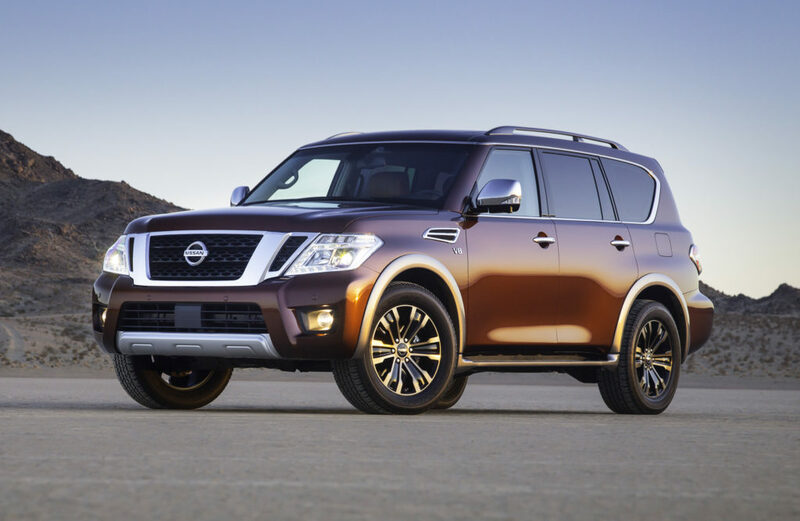 Longtime Nissan fans will note that this new Armada is no longer based on the Titan pickup truck’s underpinnings. Instead, it’s built around the legendary, tough-as-nails Patrol off-roader that Nissan sells globally. 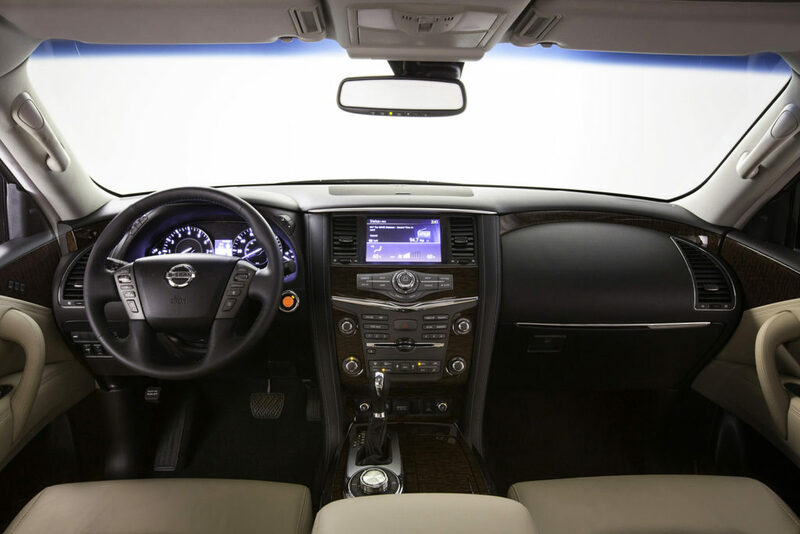 Based on the same architecture as the Infiniti QX80, the new Nissan Armada is a spacious, powerful, off-road-capable SUV that starts around $44,000. The new design is roomier and much more comfortable to drive than the previous generation and still allows for some serious off-road capability when needed. I drove the Armada both on-road and off, and it managed to shine equally well in both settings. On the highway, it’s brilliantly composed as it smooths over the bumps without making you feel overly isolated from the road. Wind and road noise are impressively absent, a factor I’ve always loved about its Infiniti cousin. It also manages to traverse steep hills and loose dirt with ease, something I wasn’t expecting from a vehicle that feels so nice on the pavement. Most SUVs make you choose one or the other — either go-anywhere capability or a comfortable ride on the street — but the Armada manages to do both jobs better than any vehicle I’ve seen in this price class. In fact, the closest vehicles it compares with in capability and comfort both start around $85,000: the Toyota Land Cruiser and the Range Rover. It seems Nissan has found a way to offer a big, do-it-all vehicle for a fraction of the entry cost of those luxury models. The new Armada’s cabin is roomier and better designed than the previous, Titan-based generation. It’s remarkably quiet and smooth over pavement. While I’ll admit it’s completely subjective, the biggest downside I see in the Armada is the way it looks. I can’t pin down one singular thing that bothers me about it, but I suspect that it’s trying to combine too many styling tricks at once — off-road bits, truck-like bits, luxury bits — and ends up smearing them together inelegantly into one vehicle. In the end, it looks like it came from an unfortunate gene pool. Not everyone agrees. Innovative cars, just like innovative art, can be incredibly polarizing at first. You never have to ask that about the new Nissans. Like the new Maxima sedan and gorgeous Murano crossover, the fresh Armada looks — and for that matter, drives — like nothing else on the road. An all-new generation of this three-row SUV makes it a capable off-roader with a soft, comfortable, quiet highway ride. It’s a rare combination, especially in this price range.